It was an early morning in late December of 2014. The first day of winter was a day or two away, and I was driving south through a snow squall toward the town of Nephi, Utah. 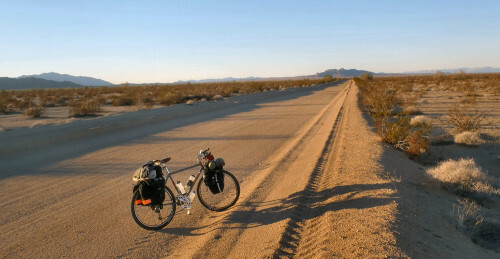 I was on my way to Needles, California, where I expected to park my truck and spend a delightful week riding my bicycle in the Mojave Desert. I had made this drive a few times before, and I was confident I'd find quiet roads, mellow temps and a lot of inspiring scenery to soothe my work-rattled nerves. It had worked for me in the past, and I had high hopes it would work again this year. and dark, but I don't mind. I ride slowly and steadily during the daylight hours, and I have routines that help pass the time during the dark evenings. And I always seem to sleep very well. After an easy, all-day drive I arrived in Needles around sunset, checked into the same cheap motel I'd used in the past, and spent the evening loading up my bike. As usual, I'd be carrying everything I might need to travel comfortably in the deserts beyond. I'd be sleeping out every night and preparing my own meals. I had a few basic tools with me and a couple of spare tubes. I had plenty of warm clothing for the chilly nights and a few “luxuries” to help ease my passage. Years of similar trips has resulted in my having a pretty reliable list of essentials to work from, and I was fairly confident I'd brought what I'd need. I left the motel after the rising sun had taken much of the chill out of the air and began riding slowly out of town. Needles' roads were quiet that morning, and its dusty palm trees and mellow temps reminded me I was a long way from the winter chill of home. I had a fairly heavy load, so I started out easy, taking time to get used to the subtle changes in the bike's handling caused by the extra weight. Most of the weight was taken up by water. I was carrying about seven liters of water in my bags and on the frame – enough to last me a few days – and that extra twenty pounds made a difference as I left town and started the gentle climb to the first pass of the day. I was riding south on U.S. 95, a two-lane blacktop highway that runs north and south along the Colorado River. I was aiming for the town of Blythe, California, about 75 miles down the road, and expected to get pretty close before the day was done. I wanted to make the best use of the minimal daylight (roughly 9 hours, or so), so I decided to spend the day riding the highway in order to put some easy miles in and gain access to what I hoped would be some interesting backroads, further south. particular hurry, and I found myself stopping frequently to check out my load and the world around me. It seems there's always something interesting to catch the eye: some intriguing, jagged mountain profile in the distance, or some “shiny object” by the side of the road. For me, bicycle touring is becoming more about slowing down and taking closer looks at what I see. I made the first pass around midday. The traffic had picked up, and I knew from previous trips that the stretch of highway that lay ahead of me had marginal shoulders. I would have to stay on my toes. However, the Mojave roads are often arrow-straight as they cross the open desert valleys, so my views of oncoming traffic can be quite good. And Cali drivers are really pretty nice. On that particular day I had a tailwind and sunny skies, too, and the next 30 miles or so passed without mishap. I stopped at Vidal Junction to top off my bottles and pick up a new ball cap to replace the one I'd left in my truck. There's a small store there and an agriculture inspection station, but not much else. Both are good sources of water. The larger town of Parker, Arizona, is down the hill to the east and across the river, a few miles from Vidal Junction, but I'd never passed through to see what sorts of amenities they might have. I knew for sure that there was at least one resort in Parker because my new cap sported a logo advertising the merits of a place called The Beach. I left Vidal Junction in the later afternoon, and spent the rest of that day cruising comfortably down Highway 95, rolling up and down as the road paralleled the meandering Colorado River. The traffic had thinned south of Vidal Junction, and the shoulder had widened, so the traveling was really very cushy. I stopped to check out a set of rather famous, Paleo-Indian intaglios by the side of the road, then rolled a mile or two further down the highway to a sneak camp up on some flats above the highway. I set up my first camp on a broad swath of firm desert pavement as the sun set over the hills to the west, then settled in for what would be the first of six long, dark and chilly nights. After a wonderfully restful and comfortable night's sleep, I crawled out of my bag as the first faint lines of light began to outline the saw-toothed mountains on the eastern horizon. Despite the chilly, pre-dawn darkness, I knew that an early start would mean more chances to ride during the precious daylight hours. So I got the stove going for my coffee and hot oats and watched the daylight slowly come into the desert. I was back on the road again by 8:30 and in the town of Blythe by late morning. I cruised the main east-west route through town, past palm trees, tire shops, taverns and fast-food joints. I had a hot lunch and refilled my bottles, then relaxed in the shade to watch the world go by and consider how I'd be spending the rest of my day. I had ridden as far south as I had intended, and was now looking forward to spending the next few days slowly riding back to the north. I'd be passing through some wide-open valleys along quiet backroads, and I fully expected to be very much on my own. I rode north out of town along a minor paved route called the Rice-Midland Road. The tailwind that had done such a nice job of pushing me south was now in my face and, though it wasn't too strong, made the going a bit slower. To make matters worse, I found I was climbing as well, though the slope, like much of the open terrain here in the Mojave, was rather gentle. The paved surface of the road turned to graded dirt a few miles north of town, and I spent the bulk of my afternoon climbing steadily toward a minor pass along the foothills of the Big Maria Mountains. sky, and I knew my second riding day would be ending soon. That was OK with me. Over the years I've come to relish those transitional times of the day: the peaceful early mornings and evenings, when the air is still, and the sun's rays are less harsh and cast the longest shadows. The desert's critters are more active, too, and the roads become less busy as folks finish getting to or from work. I was thoroughly enjoying the scene as I rode into the southern reaches of Rice Valley. Distant ranges were sharp-edged profiles on the horizon and, other than the rail lines that crisscross the open valleys here, and the occasional mine, I had the place to all to myself. My maps showed me that I was riding through the Rice Valley Wilderness area and a roadside sign also made that clear. The sign informed “motorists and bicyclists” that the road formed the wilderness boundary, and that we should stay within 100 feet of the road. As I lost the sun I made my way off the roadway along a patch of hard-surfaced desert pavement (leaving no tracks in the process) to another cozy camp spot. I got the stove going for my supper, a couple of ravens circled over my camp, checking me out and encouraging me, I thought, to relax and enjoy another lovely Mojave evening. I slept like the proverbial log and was ready to go by the time the sun had had a chance to warm the morning air. I loaded up and continued riding north on the Rice-Midland Road, enjoying the solitude and taking in the beautiful scenery. I hadn't seen a soul since the middle of the previous afternoon, and I was pretty sure I'd have the road to myself until I got a little closer to the next paved road, which was about 12 miles further to the north. This particular patch of road was well graded, and I made good time. I arrived at the rail crossing of Rice around noon, then rode west along paved Route 62 for a few miles before turning north again onto the Cadiz Road. The Cadiz Road is a graded road that runs north and south for about 50 miles. I'd traveled this way on an earlier trip and was taken by the expansive beauty of the scenery and the fairly easy riding conditions. The road passes through wide, open valleys, and past dry lake beds, and it skirts the edges of a couple wilderness areas. 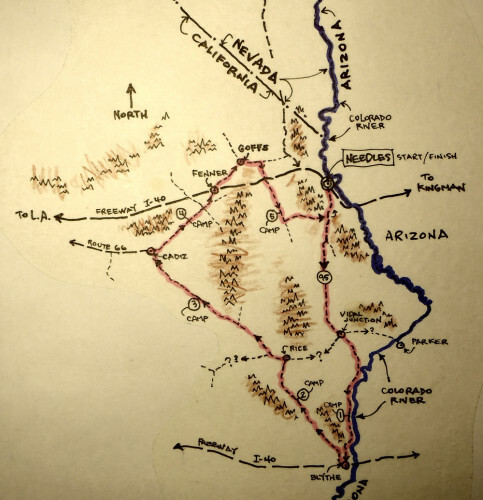 It was also a fairly direct route to my next known water supply source, and it ran roughly parallel to one of the Mojave's many rail lines. I spent the afternoon riding north without seeing another vehicle. A few birds flitted here and there in the sparse vegetation, mostly creosote and ocotillo, and I encountered a few, slow-moving tarantulas at the edges of the road. A single freight train lumbered by late in the afternoon, though the tracks were far enough away from the road that I heard only the softest rumble as it made its way north. The winds of the previous days had mellowed considerably, and I relished being able to hear the sounds of the surrounding desert and the crunching of my tires as I negotiated the varying surface conditions. I made decent progress, and I was generally able to find clean lines of travel as I navigated the roadway. But I still had to dismount fairly often when I came to the sandy bogs that are characteristic of the Mojave desert roads that cross the wide valleys. It seemed to me that the road was overdue for a visit by a county grader. I spent the remainder of the day moseying along at an easy pace, stopping for the occasional bog or roadside curiosity, and by the time the sun had settled below the horizon (around 6:30, Cali time), I was setting up another restful camp. By the time the first rays of the sun hit my camp the following morning my oatmeal was quietly reconstituting in the foot of my sleeping bag, and I was working on my second cup of java. The nighttime temps had dropped into the low 30's, but I slept warmly and deeply, and I knew the sun's rays would bring up the temps before too long. As I went through my morning chores I thought a bit about my situation. I hadn't had the opportunity to replenish my water supply since leaving Blythe, but I knew I could manage another night out before water became a problem for me. There aren't many opportunities to water-up here in the Mojave. There are none of the livestock troughs and irrigation canals and springs that one can often find in the Great Basin deserts. My maps show the occasional well or spring, usually up in the low mountain ranges, but I hadn't considered them in the past. I always carry a water filter, but I had yet to encounter any open water sources along my route. I knew I could count on water at Fenner, a gas station and oasis along I-40, another 40 miles up the road, but I still had another 20 miles of dicey conditions on the Cadiz Road before I could take advantage of the nearest pavement. Fortunately, the cool December days meant my needs weren't as acute as they might be at other times of the year. So, with my sights set on distant Fenner, I headed out onto the road once again. The day was as beautiful as could be, but an early-morning breeze had become something with a bit more kick to it, and I found myself fighting a headwind along with increasingly challenging road conditions. There were frequent, sandy stretches and a place or two where the road had been severely damaged by flash floods. I was on and off the bike every few minutes or so. It was not the best way to make progress, for sure. The winds had kicked up a fair amount of dust, too, and I found I had to hunker down now and then to sit out an especially abrasive blast. After a few hours of these conditions, I finally hit U.S. 66 at the Cadiz railroad crossing. However, I was well into the afternoon by this time and all but certain not to make Fenner by the end of my day. It was time for Plan B.
I spent the last hour or so riding easily northeast on Route 66. During that time no more than a half dozen cars passed me by. It was, after all, Christmas Day, and I assumed nearly everyone with any sense was at home, taking it easy with family and friends. I was pretty sure that traffic would pick up the next day, so I was relishing the remarkably quiet riding conditions. I ran out of light along the highway as it passed through Fenner Valley, along the southern slopes of the Clipper Mountain Wilderness. I left the highway and climbed up a gentle slope for a few hundred meters, pushing my bike over some firmly-established desert pavement that showed no signs of my passing. I picked a spot well away from the “busy” highway and settled in for my fourth evening in the desert. After another incredibly restful night's sleep I was back on the highway the next morning with about a half -liter of water to my name. Despite my dwindling water supplies, I was comfortably hydrated and ready to go. A couple of hours later, after a mellow ride along the still-quiet highway, I found myself rolling into the formerly-active railroad community and “oasis” of Fenner, California. Fenner really looks like a true desert oasis. There are statuesque palm trees waving in the breeze and a collection of somewhat shabby concrete pools and fountains that tell of a reliable source of natural water. There is a gas station at Fenner, and a well-equipped convenience store to serve the needs of the folks on I-40. I filled my bottles, munched a few treats, and watched assorted birds and motorists drawn to the sights and sounds of the pools of water, much as anyone traveling in the deserts might be tempted to do. I rode north and east from Fenner on a paved highway that leads to the town of Goffs, about ten miles down the road. Goffs is a quiet place located on the southern edge of the Mojave Natural Preserve and a great place to get a feel for what life in the Mojave desert regions is really like. Though there are no commercial conveniences to speak of, there is a wonderful museum and a collection of restored buildings (closed for the holidays when I passed through) and assorted desert “junk” from bygone days. The town lies on the railroad and was a bustling military outpost during the second World War. I've passed through Goffs a few times on past trips and have always found the few folks I've encountered to be very welcoming and enthusiastic about their community and the Mojave region in general. I left Goffs and rode east on paved road, around the north end of the Piute Mountains, and adjacent to a very busy stretch of rail line. Every half hour or so a freight train would rumble by with its load of containers on its way to Needles to the east, or west to the Pacific coast. The highway itself was very quiet. Most vehicle traffic seemed to be using I-40, which runs parallel to the Goffs road about five miles further south. As I rode, I was increasingly aware that my trip was nearing its end, and my riding was necessarily taking me in the general direction of Needles. My truck was still a day's ride away, but I had a few options about getting there. I could continue on the road I was using until it met up with U.S. 95, a few miles further east, and then south to a point where it intersects with I-40. A ten-mile, downhill run along the interstate would then take me directly into Needles again. I'd taken this route a few times before. It was a relatively quick run, but the noise and traffic intensify the closer one gets to Needles. Since I still had plenty of time, I decided to stick to the back roads and try a new route that would take me over the Sacramento Mountains to an eventual intersection with the road I'd used to leave Needles five days earlier. I left the Goffs Road about five miles east of town and rode south along one of the many powerline roads that crisscross the valleys of the Mojave. The roads aren't paved, but they are well-maintained, and I knew this particular stretch would carry me many miles south to a point where the backroad I was searching for climbs over the mountains to Needles. I passed a power tower every couple of minutes, and the soft hum of the wires gave an extra flavor to the gentle breezes I'd been enjoying all day. At one point on the road I stopped to check out an intriguing white object off in the distance and discovered the dessicated shell of a desert tortoise. I crossed I-40 for the second time that day, marveling at the sheer intensity of the traffic zooming by, and continued southeast along another powerline road. I was truly enjoying the peace and solitude, and the wonderfully easy cruising conditions, but once again, my short riding day was coming to a close. The rumble of the earlier trains was far behind me, and the freeway was no more than a string of slow-moving lights in the distance as I began looking for a pretty place to hunker down for one last night in the desert. I left the road and slowly picked my way along a sparsely vegetated drainage zone to another open camping spot, and settled in for one last, peaceful evening. My last day started much the same way as the others with a pre-dawn coffee fix and a hearty bowl of oats as the sun rose to warm the morning. My load was pretty light at this point in my journey – a good 25 pounds lighter than when I began – and I made good progress as I continued down the powerline road. I found the backroad turnoff I was searching for and headed east. The road appeared to run parallel to a pipeline of some kind, and I found the going to be great for a few miles. The road was quiet, fairly level and well-maintained, but it began to rise and fall with increased seriousness as it passed through the foothills of the Sacramento Mountains. The road ignored the contours of the terrain and insisted on following the straight line of the pipe. There was a lot of up and down riding. It was the most challenging riding of the week, and I spent a good bit of the morning pushing my load up and down a few insanely steep pitches. Eventually, I encountered U.S. 95 again, with its smooth, gentle grade. I checked for traffic, mounted up one last time, then rolled easily back down the highway to Needles, my truck, and the long haul back home. My Bike – I rode a mountain bike with a lugged-steel frame, made by the folks at Rivendell. I used beach-cruiser tires on 26″ wheels, and I carried front and rear panniers. I also carried a few basic tools and spare tubes (no flats on this, or any other Mojave trip!). Special Gear/Clothing – I always carry a lightweight tarp-sLuxuries! – I carried a minimalist Thermarest pad to supplement an old, closed-cell foam pad. I had tunes in the helter (which I have yet to use in the Mojave). I carried a dependable, cool-weather sleeping bag, and bivy sack. I had wool shirts and a sweater, cargo shorts and a pair of windproof pants, Nanopuff insulation, hats and gloves, warm socks and comfortable shoes. I was always very comfortable.evening from an old mp3 player and a tiny speaker. I used a handful of tiny, battery-powered lights that gave my evening camps a soft, lovely light. I carried a small camera, and I had a small phone to keep in touch with home. Weather – I experienced mellow, mostly sunny days with daytime temps in the 50s and 60s and the 20s and 30s at night. There were occasional clouds, no rain, variable winds, and consistently great sunsets and sunrises. The night skies are wonderful! Trip Statistics – I covered about 300 miles on a mix of paved and dirt roads. I had no mechanical or physical problems, but there seemed to be more wind and dust than on past trips. My bike and load weighed 92 pounds at the onset, and twenty-five pounds less at the end. Maps – I used the California (and Nevada) Road and Recreation Atlas from Benchmark Maps. Like all of the atlases in the series, they are reliable and very easy to read. I take only those pages I think I'll need, and I usually fill them with notes.